The 2017 Peel Out Trail Run has been canceled. ​Have a fantastic time at the 2017 Bayfield Apple Festival! Thanks for supporting local recreation! 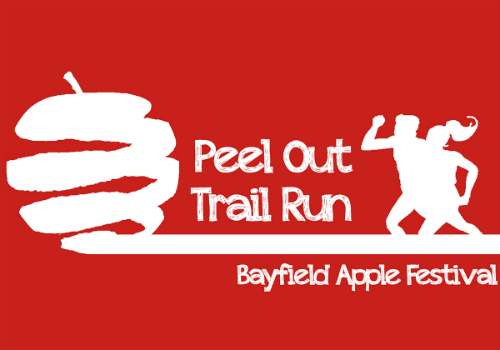 The Peel Out Trail Run is a fundraiser for the Bayfield Area Recreation Center and the Mt. Ashwabay Ski and Recreation Area. Thank you for supporting these great causes! The Bayfield Area Recreation Center is a true community center that serves all ages and layers of our population in many vital ways. In this rural and economically-challenged area, there are few other affordable and accessible places for people exercise to maintain or restore their health. The Ashwabay Outdoor Educational Foundation was established in 2002 to develop, foster and encourage outdoor winter sports, such as alpine and nordic skiing and snowboarding. The foundation wants to create opportunities for community members to participate in and contribute to the outdoor culture of the region.